Valentine's Day is coming up fast. Have you bought your sweetheart a gift yet? For those of you who need a little extra help in the gift-buying department, here are a few ideas. Shameless self-promotion here, but we think our mustache/heart pint glasses designed by Megan are a fabulous gift for the person who already has everything. Buy one and stuff a bunch of chocolate kisses in it, or buy more and wrap them up as a set. They're $3 each. It's a bargain. Did you know you can buy gift certificates for downtown Lawrence? Any of the businesses downtown who are members of Downtown Lawrence, Inc. will accept them, including the Sandbar. (Dave is the past president of DLI.) Another perfect gift for the hard-to-buy-for person on your list, because there are so many different places they can be used. You can buy them at Douglas County Bank, or you can buy them online here. This doesn't really help the ladies- well, yes it does. Girls, go fill out a wish list at Prairie Patches. Guys, go down there on Feb. 13 from 6-8 p.m. and get personalized shopping help. And there's a bonus! 10% of all sales will be donated to Habitat for Humanity's Women Build project, and if you donate to the organization you'll get a free rose in a vase. And there's more! Enjoy wine and snacks and free gift wrapping. How can you NOT do this? There you have it. Three great options for Valentine's Day gifts. You're welcome. We recently put out a call for a new Valentine's Day pint glass design, since we haven't crowdsourced a design in over a year. We got several submissions and we loved them all. Here's the first one. It's printed and ready to buy! I'll tell you a secret: I was hoping that someone out there would find a way to incorporate our love (and our customers' love) of mustaches into a Valentine's Day pint design. And Megan read my mind. The first run of 2013 Valentine pints is behind the bar, waiting for you. They're $3 each and yours to keep forever. 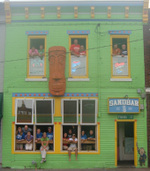 Bring them back in every Thursday for $2.50 tropical drink refills. These will also make perfect Valentine's Day gifts! We hope to have a second Valentine's Day glass soon. We're waiting to hear back from the artist. Stay tuned. Our crowdsourced pint glass designs have been popular the last several years, but it's been a whole year since we asked our customers to submit their best designs. Anyway. Check out some Thanksgiving, winter, Valentine's Day, St. Patrick's Day and graduation pint glasses for examples of designs. Our Valentine's Day glass in 2011, designed by Alison, was one of our most popular pints ever. The design has to be a black and white line art drawing. We only print single-color designs, so a design with multiple colors won't work. Shadows and other shading won't work either. Keep it simple. Remember, pint glasses aren't huge and the design will only be a few inches in size. The design should be fairly basic and not have a lot of tiny detail, and it should also translate well to a small size. You don't need to include the Sandbar name or logo. Our logo will be on the other side of the glass. We aren't going to pay you money, but if your design or idea is chosen, you'll get a pack of pint glasses, a T-shirt and a whole blog post dedicated to the things you want to share with our friends. We'll take submissions for the next two weeks, until January 21. Then, we'll pick our favorite design. We might pick more than one; we might combine designs and create a whole new one. If you can't draw, it's not a big deal. Do your best, or if you really can't draw anything at all, or design something basic on the computer, just email us the idea and we'll try to create it. So, if you've got an idea for a Valentine's Day glass, send it to us at sandbar@thesandbar.com! Disclaimer stuff: submitting your design to us gives us full rights to use it on our websites, social networking sites and merchandise. We'll give you credit everywhere we can, of course. Unless you're new around here (and if you are, that's okay! ), you already know that our founder Peach also owns the Lodge in Baldwin City, a rustic motel and banquet facility. Baldwin City is just a short drive south of Lawrence. If you haven't made plans with your valentine this weekend, check out the Lodge! They're holding a Valentine Dance from 8 p.m. to midnight. Mark Valentine and the Ticklers, the band that has headlined our annual birthday block party for the past three years, will be performing all your favorite songs. There's no cover charge for the dane, but you must be 21 or older to attend. If you want to make the night even more special, add a motel room for just $69, or a suite for $99. Call the Lodge for more information or to make reservations. You can reach them at 785.594.3900 or by email at baldwincitylodge@gmail.com. It's sure to be a fun night! We LOVE JibJab. Well, maybe the staff doesn't, but I have a lot of fun casting them in silly videos for every holiday. Happy Valentine's Day from the Sandbar crew! First up: the dynamic weekend duo of Blair and Tegan. And finally, a Valentine's Day fro-mance. We have a new pint glass for Valentine's Day! Last fall we decided to ask our friends and fans to help us come up with designs for our popular pint glasses, and we've had a great response. Susan gave us fantastic ideas for Thanksgiving and Christmas glasses, and now thanks to Alison, we have a great new glass for Valentine's Day. We'll be looking for new ideas for St. Patrick's Day, Easter, and eventually, Graduation- so if you have ideas, send them to us! Even if you can't draw, send us your idea and Dave can put it together. You'll be rewarded with a pack of pint glasses, a feature on our blog and our undying gratitude. Check back tomorrow for a profile on our Valentine's Day designer Alison. We're not trying to rush through the holidays like the retail sector, we promise. But since our Thanksgiving pint glasses weren't available for purchase until the week of Thanksgiving, we thought maybe we should prepare a little sooner for Valentine's Day. Our friend Susan gave us some fantastic designs for both Thanksgiving and Christmas glasses, and they were very popular. The last Valentine's glass I remember had two cartoon fish kissing each other. So, if you've got a great idea for a Valentine's Day glass, we'd love to hear it. You can send us an actual drawing or design, or if you're not artistically inclined, just leave a comment or send us an email and describe your idea. Dave's pretty handy, as you may know, and he actually has a degree in graphic design, so he can create almost anything. Our goal is to have the glasses in stock by early February, in plenty of time for Valentine's Day gifts for your favorite Sandbar friend. They'd be cute filled with Hershey's kisses and some Bahama Mama toys! In honor of the rapidly approaching Valentine's Day (hey guys- it's on Sunday! That's two days away! ), we recently we put out a call for Sandbar love stories. We were looking for couples who met or fell in love at The Sandbar, or who shared some other significant milestone in their relationship with us like stopping here before their wedding. Several of our fans responded with great stories! "My husband and I went to The Sandbar on our first date. He told me he loved me for the first time on a dollar bill on the wall that read "Bear loves Jaime". We partied there the night before our wedding and it is still our favorite place to this day! We loves you guys!" Jaime and her husband visited us just last weekend. We're still looking for their dollar bill...but it might have been covered up by a picture by now. "Bob and I met at the Sandbar!! I was a regular, thought Pat was a cutie so was there ALOT. Bob was always there as I was waiting in line on Tuesday nights and we just struck up a friendship. He broke the news to me that Pat was so old (uh, well to a 21 year old it seemed old, now it seems like a youngin'). Bob's smear campaign worked and he won my heart." Bob was a long-time bartender/doorguy here (he also played drums with Sellout, for those of you who follow our local cover band). He and Ashley have an adorable baby boy who spend his early days in a Sandbar onesie. While Pat may be sad that he lost out on Ashley, we're all pretty sure he's relieved at not having a baby. "I met the love of my life there- there is a dollar bill asking to meet me in Hawaii to get married- that was our original plan- not with him and my heart hurts every day." Unfortunately, not every story has a happy ending, but we were touched to hear this sweet story and know that we were part of it. We're also looking for this dollar bill. What's your Sandbar love story? Share it with us in the comments, and read past love stories here. Blair performed this Valentine's message especially for all his Sandbar fans (except he doesn't really know about it yet). As soon as I saw this personalized video option on my new favorite website, JibJab, I knew Blair was the perfect candidate. As Dave said, JibJab stole Blair's moves for this one. I used one of JibJab's pre-existing heads for the lady so none of our female staff would be embarrassed.